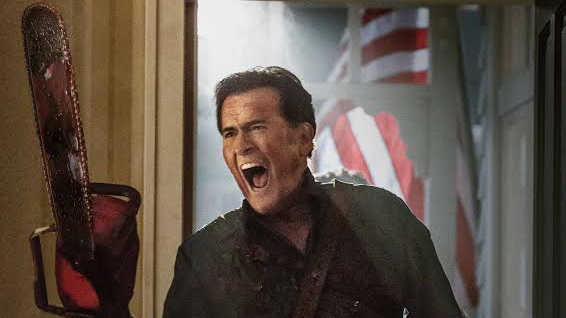 ‘Ash Vs Evil Dead’ Has A New Trailer! If there’s one thing we love here at Boomstick Comics, it’s news that deals with anything ‘Evil Dead‘ or Bruce Campbell. Luckily today, we got both, in that Starz released a new trailer for their upcoming series ‘Ash VS Evil Dead‘ starring the man god himself Bruce Campbell. We’ve written about this series so many times, whether it be casting, poster art, news, and trailers, and we will NEVER stop. This new trailer is more or less the same footage as the last trailer we posted, but instead of running at almost 3 minutes, this is less than a minute and a half. Don’t fret though, there is some new footage here to tickle your fancy until we either get a brand new trailer or get to see full episodes. What can we say? We can’t wait to see an older Ash team up with some younger locals and kill some deadites with chainsaws while keeping the housewares section at S-Mart running. The Best Trailer You’ll See is ‘Ash vs Evil Dead’!! ‘Ash vs. Evil Dead’ Already Renewed for Season 2!! ‘Army of Darkness’ Fans Rejoice With A Collector’s Edition!!! This entry was posted on Monday, August 24th, 2015 at 4:20 pm	and is filed under News, Television. You can follow any responses to this entry through the RSS 2.0 feed. You can skip to the end and leave a response. Pinging is currently not allowed.